Most cacti are easily grown from seed - and with a little patience and care they can be grown into beautiful plants. I'm growing my Lophophora, Obregonia, Acharagma, Ariocarpus and Strombocactus in more or less the same way (Strombocactus being the exception). I'm usually not sterilizing my growing medium - just filling a pot with the compost and letting it soak for a couple of minutes before sowing. In the case of Strombocactus (extremely small seed and slow growing seedlings) the compost is sterilized by bringing it to a boil in the microwave (put the pot in a plastic bag before placing it in the oven - let the compost cool completely before sowing). The seeds are placed individually (using a moist toothpick) directly on the surface of the compost and not covered. The pot is then sprinkled lightly with water and placed in a plastic bag with a bit of water at the bottom. Finally the bag is sealed closely and placed in a heated windowsill. When most of the seed have germinated and the seedlings are well established it is time to introduce them to the harsh world (usually 4-5 weeks after sowing - but Strombocactus should be left considerably longer). This is done by puncturing the sealed bag to make the “atmosphere” less humid. The punctures are gradually expanded until the bag can be completely removed after 1-2 weeks. Until the roots are well established the seedlings must not be left dry for extended periods - this winter I almost killed off last years stock of Lophophora fricii seedlings by leaving them dry for 5 weeks! The British Cactus and Succulent Society has a page on how to grow cacti and other succulent plants from seed. Steve Brack's Mesa garden has a list of basic germination tips. Below is a list of retailers/nurseries selling cactus seed and plants. I've only listed vendors I've done business with. If you are looking to buy peyote seeds or plants, please check your local laws before doing so. All parts of peyote (Lophophora williamsii) plants and the seeds thereof are classified as Schedule I substances in the United States. Also, peyote is illegal to posses in France, Russia, and possibly more countries. Jan Martin Jecminek has a lot of different seed. Many with locality information. Another Czech seed retailer is Chrudimsky kaktusar. They are also selling plants. The germination rate of Pavel Pavlicek's seed is incredibly high. Yet another Czech vendor is Jaromír Dohnalík (the Czechs are big in the cacti business). Kaktusy Ryšavý has many different Lophophora seeds with locality information (and is by coincidence also Czech ;-). If you can't find the seeds you're looking for at Steve Brack's Mesa Garden, you probably can't find it anywhere (except peyote seeds - illegal in the USA). Köhres-Kakteen also have a large selection of cactus seeds - you can find their Lophophora seeds on their general cactus seed list (offering thousands of different varieties of cacti) or have a look at the dedicated "peyote seed list" found at Lophophora.info. Navajo Country - Pediocactus, Sclerocactus, Navajoa, Toumeya and other hardy cacti. Mesa Garden, Uhlig-Kakteen, Kakteen-Haage, and Albert Plapp all have huge selections of plants. The German retailer Kakteen Kliem has a good selection of plants with locality information. I have joined Cactus Plaza's affiliate program meaning that if you click through to Cactus Plaza and make a purchase, I'll receive a commission helping me to run this blog. Prior to joining the program I tested the quality of Cactus Plaza's goods and services by ordering this splendid crested Lophophora williamsii. Seedlingservice.com (also by CactusPlaza) offers healthy and naturally grown seedlings of cacti and other succulents. Allies (formerly ...of the jungle) carries a good selection of Trichocereus cuttings (I bought Trichocereus 'Juul's Giant'). The people at Allies are extremely helpful and friendly, and their cuttings are healthy and good value. Ariocarpus, Living rocks of Mexico - History, species and habitat information, field numbers etc. Everything you ever wanted to know about Ariocarpus. Cactus Conservation Institute - The CCI is dedicated to the study and preservation of vulnerable cacti in their natural range – starting with peyote and star cactus. At their site you find information on the latest research by Martin Terry et. al. The Cactus and Succulent Plant Mall - An extensive collection of links to organizations and information, including societies, clubs, nurseries, and literature. If you are curious to learn the etymology of words like e.g. Lophophora, diffusa, and decipiens The Dictionary of Botanical Epithets is a great resource. Köhres' Lophophora information - A lot of habitat Lophophora photos. 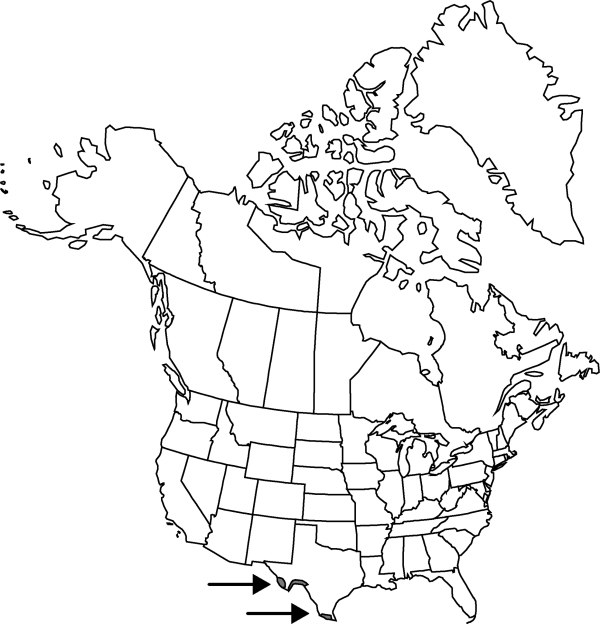 Ordered by state, location and species. Ralph Martin's Field Number Database - Ever wondered what a field number like "SB 854" meant? Check it out at Ralph's cactus and succulent field number query page. Bohemia Cactus - Cacti and succulents, books, journals, free links, advertisements and more. 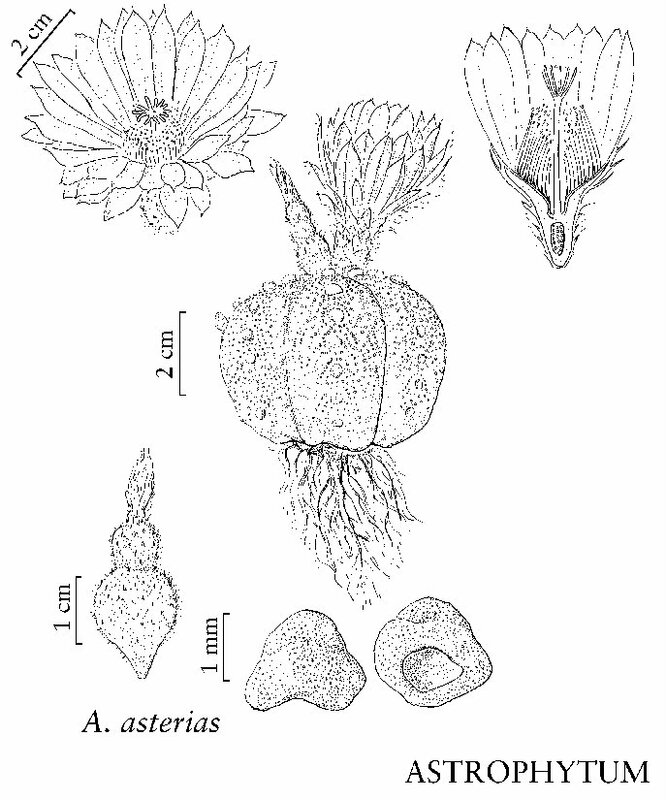 A Preliminary Revision of the North American Species of Cactus, Anhalonium, and Lophophora. 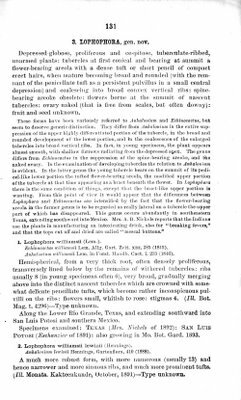 My local copy of the article contains Coulter's proposal for a new genus for peyote alone: Lophophora. 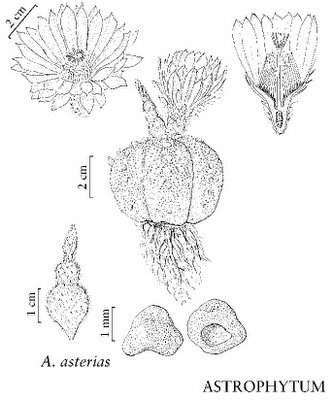 The full, unformatted text can be found as a Project Gutenberg Etext, also an abridged (the sections relating to Ariocarpus/Anhalonium species are reproduced), formatted version of the article is available at Living Rocks of Mexico. 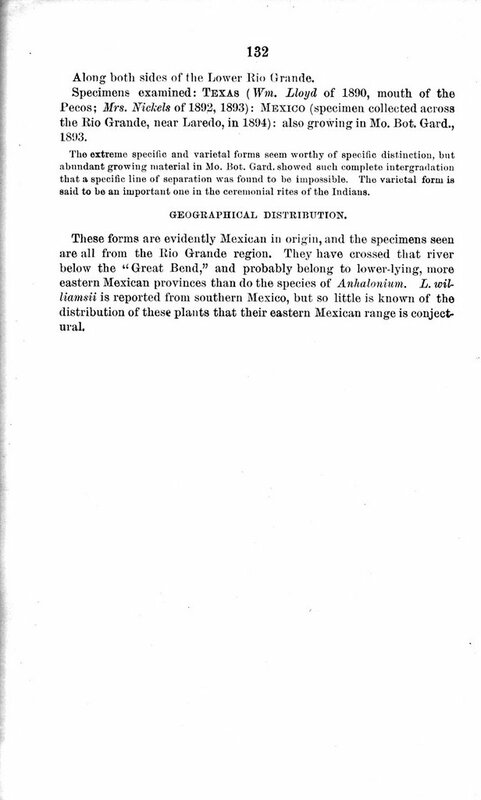 The Flora of North America provides an account of American plant species north of Mexico. Below I have included the descriptions for a list of species relevant to this site. Molecular systematics of Tribe Cacteae (Cactaceae: Cactoideae): A phylogeny based on rpl16 intron sequence variation. The paper documents the close relationship among Acharagma, Lophophora and Obregonia. Based on DNA evidence the species are placed in a well-supported clade (the Lophophora Clade). ABSTRACT. Parsimony analysis of plastid rpl16 sequences from 62 members of Tribe Cacteae, and four outgroup taxa yielded 1296 equally parsimonious trees of length 666. Strict consensus evaluation of these trees established a highly pectinate topology, which delimited clades within the tribe that correspond to several previously considered generic groups. Aztekium and Geohintonia, which manifest ribs in their stem morphology were shown to represent an early divergence in the tribe, forming a sister group to remaining members of the tribe. Clades containing other genera having ribbed stems also are basal to those that develop tubercles. The most derived clade forms a distinct group of typically small stemmed species with tubercular stem morphology. 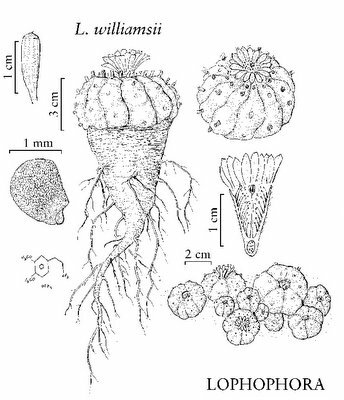 Within Mammillaria, species formerly placed in the genus Cochemiea and members of the Series Ancistracanthae formed a well-supported, sister clade to the remaining members of Mammillaria. Length variation of the intron in two members of Mammillaria series Stylothelae was also observed. 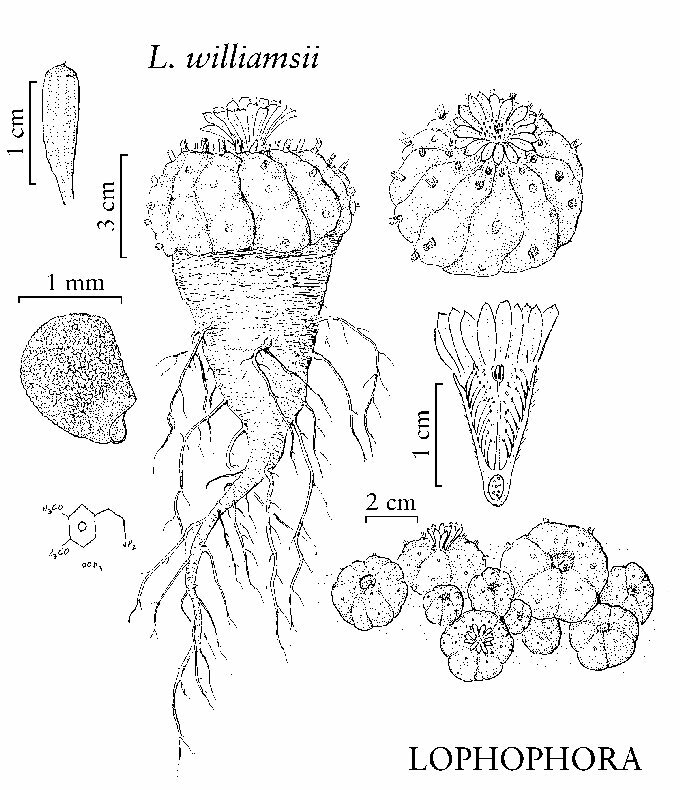 Preliminary Revision of the North American Species of Cactus, Anhalonium, and Lophophora. scales, but often downy): fruit and seed unknown. dried are called "mescal buttons." Echinocactus williamsii Lem. Allg. Gart. Zeit. xiii. 385 (1845). Anhalonium williamsii Lem. in Forst Handb. Cact. i. 233 (1846). San Luis Potosi and southern Mexico. Potosi (Eschanzier of 1891): also growing in Mo. Bot. Gard. 1893. 2. Lophophora williamsii lewinii (Hennings). Anhalonium lewinii Hennings, Gartenflora, 410 (1888). tufts. (Ill. Monats. Kakteenkunde, October, 1891) - Type unknown. Along both sides of the Lower Rio Grande. distinction, but abundant growing material in Mo. Bot. Gard. eastern Mexican provinces than do the species of Anhalonium. 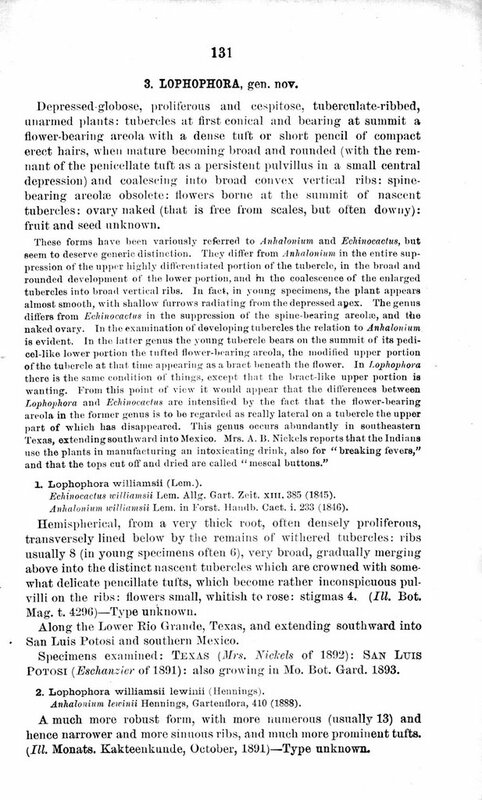 The above text is based on scanned pages from the Contributions from the United States National Herbarium Vol. III. The scans are included below and are courtesy of the Botanicus Digital Library, Missouri Botanical Garden. High-resolution copies of the scans can be found in the files section of the Lophophora Google group. 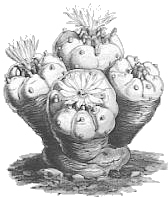 The first illustration of peyote appeared in Curtis's Botanical Magazine in 1847 (plate 4296). Lemaire, Cact. Gen. Sp. Nov. 3. 1839. Plants stem succulents, unbranched [to several branched from base], mostly low and deep-seated in substrate [taller in Mexican species]. Roots diffuse. Stem unsegmented, dark green or gray-green, hemispheric or depressed-spheric [to spheric or short cylindric], (2.5-)6-15(-60)[-100] × 6-10(-20) cm, speckled [or entirely hidden] by numerous tufts of dense, whitish, multicellular hairs less than 0.5 mm; ribs [4-]8-10, crests uninterrupted, straight [to sinuous and/or helically curving around stem], broad and nearly flat or rounded [sharp or keeled]; areoles distinct, [2-]6-9[-20] mm apart along ribs, circular; areolar glands absent; cortex and pith hard, not mucilaginous. Spines absent [1-25 per areole in some Mexican species]. Flowers diurnal, near stem apex, at adaxial edge of areoles, funnelform, 4.5-5.4[-8] × 3.8-5.2[-6] cm; inner tepals yellow, proximally red [all yellow], 25 × 6-10[-12] mm, margins entire; ovary sparsely to densely scaly, axils spineless long hairy with arachnoid trichomes, distal scales spine-tipped; stigma lobes [8-]10-12, yellow [pale yellowish], 4 mm. Fruits indehiscent or splitting irregularly, green or pinkish to red, ovoid to spheric, 15-20 × 12 mm, initially fleshy, drying immediately after ripening, sparsely to densely scaly with spine-tipped scales; axils of scales long woolly, spineless; floral remnant persistent. Seeds dark brown to blackish, appearing hollow or bowl-shaped from strongly expanded, inrolled rim around sunken hilum, 2-3 mm in greatest dimension, nearly smooth; testa cells very slightly convex. x = 11. 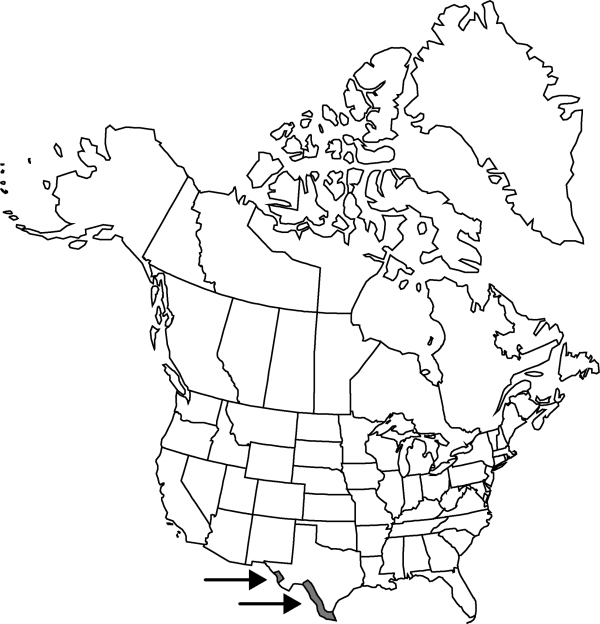 Species 4-5 (1 in the flora): sw United States, Mexico. Astrophytum is most often recognized as a distinct genus. Chloroplast DNA evidence (C. A. Butterworth et al. 2002), however, confirms that it is among the closest relatives of Echinocactus. Unlike Echinocactus, the stem surfaces of Astrophytum species are speckled by numerous tiny white tufts of minute, matted hairs in addition to the regularly spaced woolly areoles. 1. Astrophytum asterias (Zuccarini) Lemaire, Cactées. 50. 1868. Plants flat-topped and usually flush with soil surface, or at most, above-ground portion low, dome-shaped. Stems shiny, sparsely speckled by bright white extra-areolar hair tufts 0.5-1 mm diam. ; ribs usually 8, straight, very low, nearly flat or rounded; areoles 3-5 mm diam., with yellow or gray wool. Flowers opening widely, externally long woolly; inner tepals lanceolate, acuminate. 2n = 22. Flowering Mar-May and sporadically after summer rainfall. Grasslands, shrublands, Tamaulipan thorn scrub, gravelly slopes and deep soil of flats; of conservation concern; 20-100 m; Tex. ; Mexico (Nuevo León, Tamaulipas). 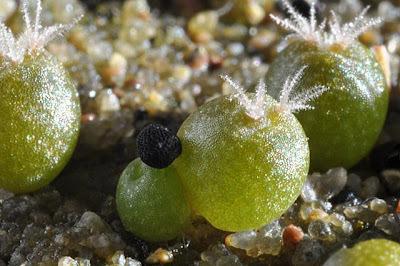 The vernacular name of Astrophytum asterias, star-peyote, reflects its superficial similarity to peyote, Lophophora williamsii, which has very soft, uniformly pale blue-green stems quite unlike the hard, speckled, almost shiny, green stem surface in A. asterias. Astrophytum asterias is extremely rare and localized north of Mexico, presently known only from Starr County, Texas. The Flora of North America web site. J. M. Coulter, Contr. U.S. Natl. Herb. 3: 131. 1894. Plants erect, commonly unbranched, becoming many branched and moundlike in old age, deep-seated in substrate. Roots taproots. Stems unsegmented, usually gray-green or blue-green to dark green [yellow-green in L. diffusa of Mexico], usually flat-topped and cryptic in soil surface, sometimes protruding above it with recessed apex, ribbed or weakly tuberculate, 2-7.5 × (4-)5-12 cm, softly fleshy, soft skinned, dull, glabrous; ribs 5, 8, or 13 (rarely 21), low, broadly rounded, straight, vertical or less often helically curved around stem; areoles 3-15+ mm apart along ribs or at apices of low, humplike tubercles, circular, copiously hairy, hairs usually in compact, erect tufts to 7-10 mm; areolar glands absent; cortex and pith not mucilaginous. Spines absent. Flowers diurnal, deeply nestled in copious areolar hairs at stem apex, arising from adaxial edges of areoles, campanulate, 1-3 × (1-)1.5-2.5 cm; outer tepals whitish to greenish pink, midrib greenish, margins entire or minutely fringed or ciliate distally; inner tepals usually white to pink [rarely yellowish white or magenta to reddish violet, at least in Coahuila, Mexico], 8-14(-22) × (1-)2.5-5 mm, margins ciliate or entire; ovary smooth, scales, hairs, and spines absent; stigma lobes (3-)4-8, white or pinkish, 1-3 mm. Fruits indehiscent, white to pinkish [to purple], clavate to nearly cylindric, 11-25 × (2-)4-5 mm, weakly succulent, quickly drying and contracting after ripening, upon drying becoming translucent and brownish white or whitish, spines and scales absent; pulp colorless; floral remnant weakly persistent or tardily deciduous. Seeds black, somewhat pyriform, cylindric, or obovoid, 1-1.5 × 1-1.2 mm, not glossy, with large, flat hilum; testa cells strongly convex. x = 11. Species 2 (1 in the flora): arid regions, sw United States, Mexico. 1. Lophophora williamsii (Lemaire ex Salm-Dyck) J. M. Coulter, Contr. U.S. Natl. Herb. 3: 131. 1894. Plants 0-50-branched, nearly flush with soil surface. Roots fleshy, broadly carrot-shaped, 6-12 cm. Stems flat or domelike with deeply depressed center; ribs to 25 mm broad. Flowers: outer tepals narrowly elliptic to oblanceolate, apex acute, mucronate; inner tepals elliptic, margins white to greenish pink, midstripes darker, apex mucronate or attenuate; ovary 3-4.5 mm; styles white, 5-14 mm. 2n = 22. Flowering Mar-May(-Sep). Chihuahuan desert scrub, Tamaulipan thorn scrub, usually on or near limestone hills; 100-1500[-1900] m; Tex. ; Mexico (Chihuahua, Coahuila, Nuevo León, San Luis Potosí, Tamaulipas, Zacatecas). Long used for religious and medicinal purposes by native peoples, Lophophora williamsii is famous for its psychoactive alkaloids, primarily mescaline, which are concentrated in the small, photosynthetic, above-ground portion of the stem. Experienced peyoteros harvest only the top few millimeters of the stem, leaving the deeply recessed apical meristem, thus allowing regeneration. The plants live for many decades and grow very slowly. Anhalonium, a later name for Ariocarpus, has been applied to species of Lophophora, and was widely used in older pharmaceutical literature. Fruits abruptly ripen up to one year (rarely longer) after flowering. Scheidweiler, Bull. Acad. Roy. Sci. Bruxelles. 5: 491, figs. 1-5. 1838. Plants erect, unbranched [or branched], deep-seated in the substrate [or somewhat subterranean for whole seasons]. Roots taproots. Stem unsegmented, gray-green (yellow-green or purplish with age or stress), above-ground portion flat, concave, or weakly hemispheric, usually flush with soil surface and cryptic, strongly tuberculate, 0-2(-10) × [3-]5-10(-15) cm, hard, rigid, tough skinned [thin skinned in A. agavoides of Mexico]; tubercles arranged in rosettes or mosaics, ± triangular, 8-20[-60] × [3-]11-25 mm, hard, exposed faces of tubercles strongly differentiated from sides [except in some Mexican species], prominently fissured [wrinkled, roughened, or nearly smooth]; areoles elongate [circular and axillary, circular and subapical, or 2-parted], forming a wide woolly groove on each tubercle; areolar glands absent; cortex and pith not mucilaginous, "mucilage" restricted to elongate cavities. Spines absent [sporadic and rudimentary in some Mexican taxa]. Flowers diurnal, borne in axils of tubercles near stem apex, broadly funnelform to almost salverform, 1.5-5 × 1.5-5 cm; outer tepals brownish or greenish with pink tinge, 12-35 × 5-9 mm, margins entire; inner tepals pink or magenta [white or yellow], 13-34 × 4-10 mm, margins entire; ovary smooth (scales, hairs, and spines absent); stigma lobes 5-10, white, 1.2-5 mm. Fruits indehiscent (very rarely explosively dehiscent), white or cream to pale greenish [reddish], spheric to clavate or cylindric, proximally or almost completely buried in copious wool of stem apex, 10-25 × 5-10 mm, initially fleshy, drying and collapsing a few days after ripening, scales and spines absent; pulp white to pale greenish; floral remnant apparently persistent. Seeds black, spheric to obovoid, 1.2-1.6(-2.5) mm, minutely tuberculate, shiny; testa cells strongly convex (conspicuous with lens). x = 11. 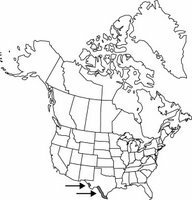 Species 6 (1 in the flora): arid regions, sw United States, Mexico. Ariocarpus species mostly grow in broken rock substrate and closely mimic it. Some Mexican species display additional adaptations, e.g., A. kotschoubeyanus (K. Schumann) K. Schumann withdraws into seasonally inundated, fine lacustrine soil and can be completely buried between growing seasons. SELECTED REFERENCES Anderson, E. F. 1965. 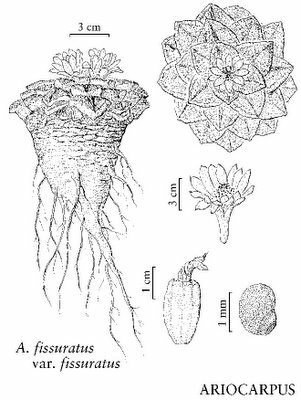 A taxonomic revision of Ariocarpus. Cact. Succ. J. (Los Angeles) 37: 39-49. Anderson, E. F. and W. A. Fitz Maurice. 1997. Ariocarpus revisited. Haseltonia 5: 1-20. 1. 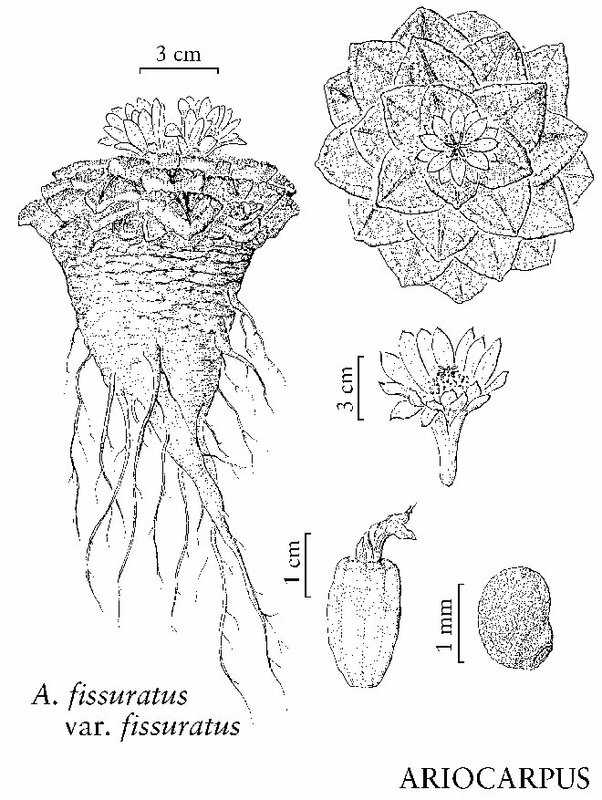 Ariocarpus fissuratus (Engelmann) K. Schumann in H. G. A. Engler and K. Prantl, Nat. Pflanzenfam. 106[III,6a]: 195. 1894. 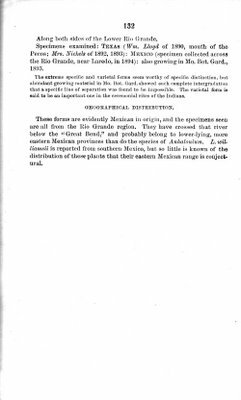 Varieties 1-3 (1 in the flora): Texas, Mexico. Plants protruding above ground 0-2(-10) cm. Stems: tubercles forming coarse mosaic, closely packed, exposed faces of tubercles deltoid to hemispheric, deeply fissured on either side of central areolar groove, coarsely rugose, often sharply angled apically; areoles to 3 mm wide, sometimes confined to middle of tubercle faces instead of extending to tips. Flowers 2.5-5 cm diam., 2 times wider than long when fully expanded; inner tepals 21-30 × 5.5-7.5(-10) mm. Flowering Sep-Nov. Chihuahuan desert scrub, low, rocky hills of limestone chips; 500-1500 m; Tex. ; Mexico (Chihuahua, Coahuila, Durango). The stems of Ariocarpus fissuratus are normally flush with the soil surface and resemble limestone chips in shape, color, and texture, rendering the plants extremely cryptic. The species is often found growing with Agave lechuguilla and species of Leucophyllum, and Parthenium. Enter your contact information and message in the form below to get in touch with the Lophophora Blog. Please notice that the information in the CAPTCHA image is case-sensitive. 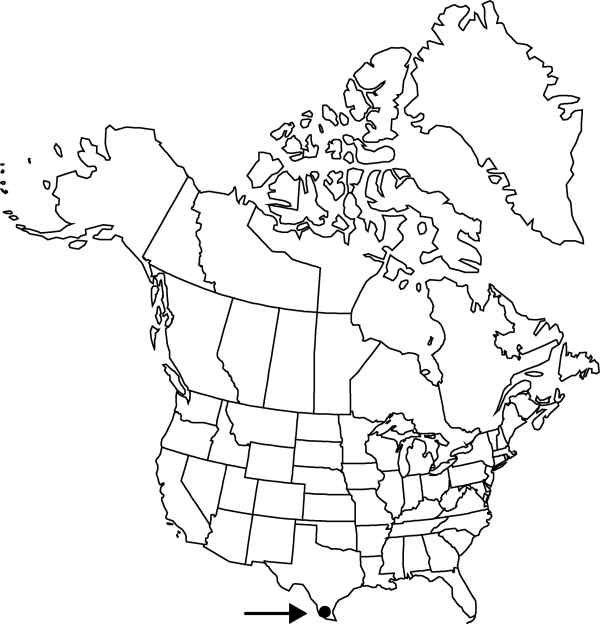 This site map was generated programmatically May 05, 2013. Posts, comments, and topics added to The Lophophora Blog after this date are not reflected in this index. At the time of writing the blog has a total of 201 posts, 718 comments, 115 topics, and 4 pages. It would go too far to list all comments but below you can find links to the ten most commented-upon posts. The following list has links to all posts listed in reverse chronological order. Key to the genus Lophophora sensu Šnicer et al. I used to keep static information in the "2000" posts but Blogger recently introduced pages for this purpose which I'll use in the future. Currently the blog has 4 pages. The following topics/labels are used for categorizing and grouping posts on the Lophophora Blog. The topics are listed alphabetically.